This is an original, first-release, 68.5x94cmish one-sheet movie poster for Disney's enduring classic. The poster still has the lot number ticket (lot 188/sale 5677) affixed to it. There are some condition issues. There is a long, closed tear in the upper left quadrant of around 20 inches. There is also a substituted section in the left-hand margin of around 5x2 inches. There is also surface some surface dirt. There may be other, lesser signs of age and use - please examine the images, which form part of the description. The poster needs to be cleaned, re-backed and the repaired areas re-fixed. On the plus side, the colours are very strong and the poster will, overall, display very well from any normal viewing distance once you spend a few dollars on it. A rare poster on a beloved title. Thanks for looking - please ask all and any questions. 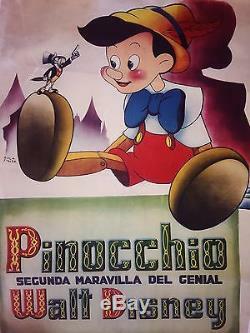 The item "PINOCCHIO original vintage one sheet movie film poster 1940 WALT DISNEY RKO" is in sale since Monday, October 10, 2016. This item is in the category "Entertainment Memorabilia\Movie Memorabilia\Posters\Originals-United States\Pre-1940". The seller is "litho_lover" and is located in Wigan.